How many reporters of The UOS Times will pursue journalism as a career later in life? Sadly, judging by the opinions of our current seniors, that number appears to be very low. Like the rest of us, they first gathered together with a dream and an interest in journalism, but being a reporter in the real world is different from what they thought. When 2014 was coming to an end, a reception for The UOS Times alumni association was held in December. At the gathering, we had the opportunity to speak with a reporter alumnus, Park Jun-kyu (Dept. of Business Administration, ’06). The interview turned into an interesting meeting between the “old guard” and a new reporter. Hello. I am Park Jun-kyu, working as a reporter for the Retail and Real Estate Desk of the Herald Business. I worked at The UOS Times as a 26th Reporter for two years from 2006 to 2008 until I joined the army. This is my first experience as an interviewee. I have always been an interviewer in a case like this. When and how did you start dreaming of becoming a reporter? Becoming a reporter was my dream for a long time. I remember the crucial moment in deciding my dream was when the 2002 World Cup was held in Korea. After this big event, I became crazy about sports, but I realized that I could never become a professional soccer player; I was too old. Instead, I decided to do a job that involved watching and reporting on sports. I liked writing very much and kept a diary every day. I had a good time reading to my friends the ridiculous stories I wrote. Thus, my dream started as a combination of sports and writing which I both loved. However, you studied a different major, Business Administration. Of course I originally hoped to major in a related field, such as Mass Communication, Communication Sciences, etc., but my parents wanted me to choose a “popular” major like Business Administration or Economics. When I was a student, I was always obedient to my parents. My cousin and my mentor also told me that majoring in Business Administration does not necessarily mean managing a business in the future. In the end, I still had faith that I could become a reporter even though I chose to major in Business Administration when I entered the university. Did working at The UOS Times help you become a reporter? The UOS Times may be small in scale, but it is definitely a proper press. We basically gathered news and wrote articles; There was also the process of proofreading called “desking.” That is why I think joining The UOS Times was a good choice. Having such a structure and an organized system was really important and helpful to me. What was your most memorable news last year? I entered the press last year. 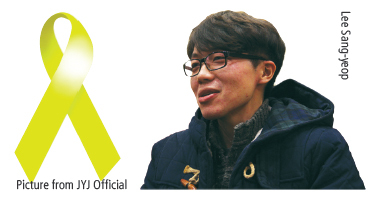 Less than a month later, the Sewol Ferry Incident occurred. It was a very big tragedy, causing many casualties. In particular, families of the victims were very sensitive about reporting. A premature approach was not allowed. Having a notepad and a smart phone openly which identified us as reporters was also a taboo. It was a difficult time. One of the articles I wrote at that time was about a volunteer group of taxi drivers. They belonged to the Ansan Individual Cab Union, and offered free rides for the bereaved families between Pengmok Harbor and Ansan. This article took a fresh approach to a mournful news topic and drew lots of attention. A large number of readers wrote positive comments online. What news are you hoping to report this year? Since I work in the real estate section, I would like to report on the current housing problem in Korea. It is quite serious problem for those in the younger generation such as university students and newlyweds. By reporting bright news on this topic, I want to help them to regain their strength. Nowadays, stories about reporters appear in a number of TV series such as Healer of KBS and Pinocchio of SBS. The former is about a broadcaster and an online newspaper reporter. The latter addresses the reality of commercialism in the press. What both series are very impressive. For example, in Healer, the reporter washes his hair with toilet water and dries his hair by hand dryer, not wasting a minute to write articles. In the TV series, the image of reporters is very impressive. I had already heard of this series and saw some of those scenes. I think that story was done a little bit over-the-top to make it them dramatic. However, during the probation period, the working environment among new reporters is really hectic. When I was in that period, I saw that my female colleagues bought and used dry shampoo which does not need water. The series also dealt with rather controversial subjects like distorted journalism. It is not the most serious thing I have ever seen. I just think there is a desire to create titles that make articles seem more provocative. Although the contents of news online and offline are the same, the press tries to create free and more provocative titles than the others in order to increase the number of readers online. This shows one aspect of encroaching commercialism. What are the required abilities as reporters? Many sources of news come from the people. That is why the reporter needs to be able to talk with anybody. Many people are naturally very shy. In other words, it is okay to write a clumsy article, but being afraid to reach out to others is not okay. The method of interaction with others is important. I cannot always meet ordinary and understandable people. Sometimes, there are contentious people or sensitive people, such as those involved in the Sewol Ferry Incident, with whom the reporters need to show careful consideration. Newspaper reporting is considered as an endangered job especially as internet and mobile communication devices are developing. What do you think of the uncertain future of reporters? I do not believe that reporters are disappearing. SNS is not sufficient to deliver high quality news. Only the platform for reading an article will change and diversify. Already many press organizations distribute the news through internet sites and mobile applications. It is not difficult to change a newspaper article into an internet article. This is the age of the platform. If the power of the platform is transferred to others, the press seems to be in danger of being subjected to them. Yes. Naver may be the best example of that. At first, Naver was considered as a convenient way to distribute and receive news, but now the independence and profitability of the press is in danger of collapsing. Exclusive online-news distributors like Naver serve as potential threats to the press. Many members of the press are aware of this and are trying to make their own premium sites as platforms. We will have to see how it goes. What is your dream in the future? First of all, I would like to achieve recognition as a reporter. Then, I would like to teach journalism to students at UOS. UOS has no journalism-related major. It seems that they have little or no interest in developing this field. Our school merely helps the student groups preparing the bar exam or the civil service exams while many other universities support students with the exams in various fields including journalism. I want help my school juniors who wanted to become journalists. Lastly, can you please give some advice to UOS juniors? I think we should learn the way of being alone. Eating alone, for example, is something that is not easy for a lot of people to do. If possible, try to get used to being alone! Life is commonly known to be solitary, and I agree completely. I am sure that people have had many lonely moments outside of their social lives. Therefore, if you have much self-respect and mental strength, they will help you when you are alone. You can do much more things. After we finished the interview, he told me that this interview brought back many old memories. The interview gave the member of The UOS Times encouragement and a blueprint for the future. Including Park, we are hoping that this article encourages the lonely marathoners at UOS to continue to sprint towards their goals.